The Dogs and I arrived in Bethel after 16 hours of airport and airplane time. The dogs traveled well. We had a 6 hour layover in Anchorage and I was able to claim the dogs, walk them and play ball with them in the baggage claim area. Tom took us on a walk outside of town when I got off the plane and we found lots of birds and blueberries to amuse ourselves. I can’t imagine not having rubber boots here. There are puddles and mud everywhere. I guess they decided to tear up all of the roads in Bethel all at once to redo them. The traffic is horrible. People drive like New Yorkers. They even have Bethel belt line traffic reports. At least I am not the only one with a dirty dusty car in the parking lot anymore. 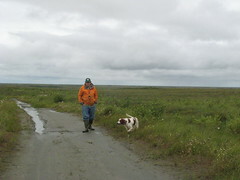 We are spending most of our time unpacking the rest of our boxes and walking the dogs in the tundra. Nolan found 8 Willow Ptarmagin on Sunday. The season opens next week. Reason # 46 we need a boat, I am told. #46, wow. Looks really nice, the tundra does! Congratulations on your great new adventure and for those of us who will never get to experience it thank you for your blog. We will continually check your site out and will so enjoy all your adventures. Have fun…we are looking forward to at least 3 years of reading all the exciting things you will be doing. And Andrea…did you get your new camera!!! Those pictures are VERY important to all of us.